The CleverSpa® Hot Tub Collection. 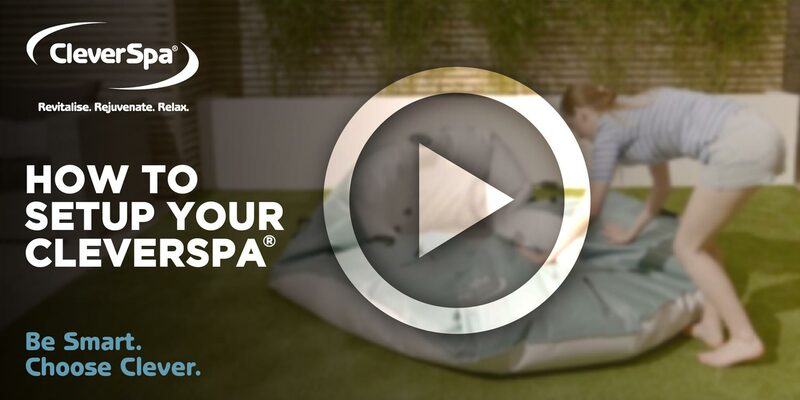 Welcome to CleverSpa®, the inflatable hot tub range that is the perfect addition to any garden. Our CleverSpa® is ideal for winding down after a hard day’s work, enjoying with friends and family or for celebrating that extra special occasion. CleverSpa® hot tubs are designed to be enjoyed all year round, whether on those hot summer days or to warm you up on colder winter nights, so if you want to revitalise, rejuvenate and relax, be smart and choose CleverSpa®. Take a look at our stunning new range of inflatable hot tubs. It’s time to relax, rejuvenate and revitalize in your very own CleverSpa®. Water treatment is an essential part of owning a hot tub. That is why CleverSpa® have created a range of chemicals to help you keep your hot tub clean and safe. For added peace of mind at an affordable price… Be Smart. Choose Clever. Everything you need to have you relaxed and unwinding in no time. Learn how to set up and inflate your CleverSpa®, set the hot tub temperature, change a hot tub filter and more. The CleverSpa® has been designed with you in mind. With its unique built-in pump & heating system, you can position your spa wherever you desire. No stress. No hassle. No fuss! A real person answered the phone with is such a breath of fresh air! "I have had my CleverSpa for 6 months now and it has been a fantastic product really easy to use and reasonable running cost, I have had a few problems with it, and have to say CleverSpa really stepped up to the mark, fast response to problems with a first class customer service and above all a real person answered the phone with is such a breath of fresh air!!!! Highly recommended definitely buy another one, I have owned a few inflatable hot tubs and this one is by far the best cheers guys!!!!!" "I bought a clever spa hot tub in May 2018 and had a minor issue with it spoke to clever spa a lady called Jill who arranged very quickly for us to send it back to them free of charge and they sorted our problem out within a few days with no problem great communication and a great service would highly recommend this company over any other!! Also the actual hot tub is a much better idea with the heater built in." "Absolutely fantastic customer service from the guys at CleverSpa. Rang with an issue first thing Friday morning and by lunchtime everything sorted for the hot weekend." "We recently encountered a problem with our inflatable hot tub and emailed the support team. The service that we have received from Jill has been outstanding from start to finish from trouble shooting tips to arranging a suitable pick up time and arranging a replacement hot tub to be sent to us all in a timely manner. We are extremely happy with our hot tub and would happily recommend CleverSpa to family and friends. It is easy to set up and extremely quiet when in use compared to other spas we have used in the past. A big thanks to Jill once again and keep up the excellent service." "We simply can’t thank both Gill and Mark enough for their first class service which we have continued to receive, even after purchase of our CleverSpa Waikiki 6 Person Hot Tub. Your customer service and care has been first class, at every point & we would thoroughly recommend CleverSpa products. Delivery has been on time as specified & any problems we encountered were dealt with swiftly & thoroughly. Thank you so much for going the extra mile - it has been such a pleasure to find a company & staff that want the very best for their customers."